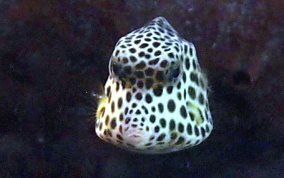 The Spotted trunkfish is often confused with the Smooth Trunkfish. 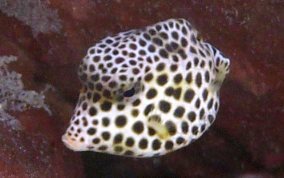 The Spotted Trunkfish always has what looks to me like the "Big Dipper" Constellation of white stars on his sides but no honeycombed pattern, just spots. They will tolerate a somewhat close approach if you move very slowly. Sometimes, when they are busy looking for food, they will actually come nearer to you IF you are motionless when they first see you and you remain still. They can grow to almost 1.5 feet long and can be found at depths of 3 feet and deeper.